In August 2008 the American Board of Surgeons announced new requirements for general surgery residents seeking board certification that will be implemented beginning July 2009. All residents in the class of 2009-10 and later will have to complete the Fundamentals of Laparoscopic Surgery (FLS) certification in addition to the current necessary certifications in ACLS and ATLS. Prior to this announcement the Washington Hospital Center started a training program for general surgery residents to practice the hands on FLS skills in preparation for FLS certification. 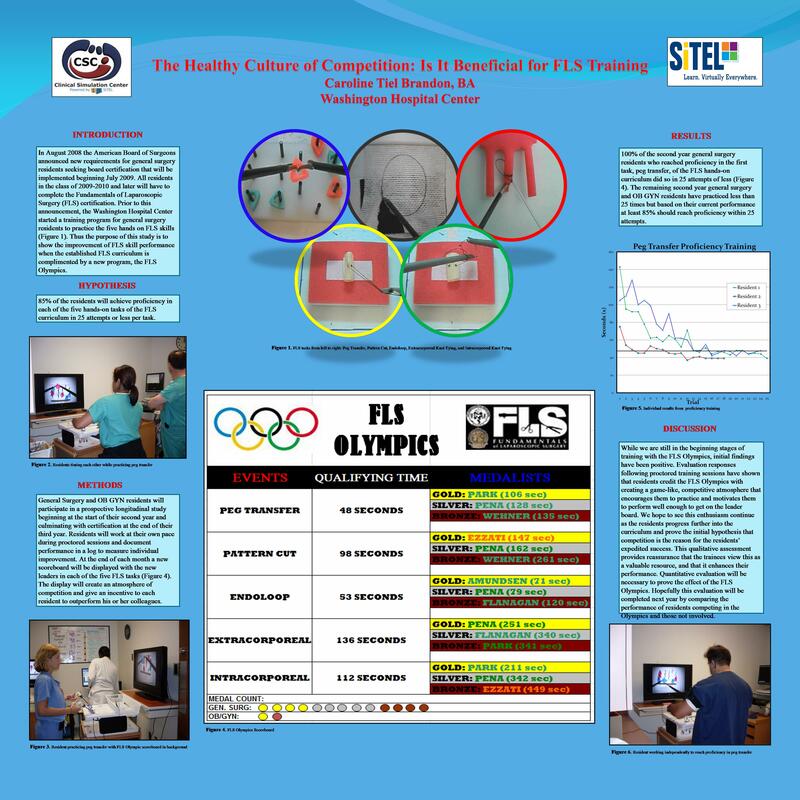 Thus the purpose of this study is to show the initial findings of FLS skill performance when the established FLS curriculum is complimented by a new program, the FLS Olympics. General surgery and OB GYN residents will participate in a prospective longitudinal study beginning at the start of their second year and culminating with certification at the end of the their third year. Residents will work at their own pace to reach a pre-established level of proficiency in each of the five tasks in the FLS curriculum. There will be proctored sessions to document performance in a log so individual improvement can be traced. At the end of each month a scoreboard will show the new leaders in each skill. The display will create an atmosphere of competition and give an incentive to each resident to outperform their colleagues. We plan to present initial findings that support the notion that the addition of competition will reduce time needed to achieve proficiency. Instead of the 80 tries to reach proficiency in the FLS curriculum, we predict that 85% of the residents will achieve proficiency with 25 attempts for each of the five tasks. The faster the competition is moving through the curriculum, the faster each resident will progress. Incorporating competition is an easy mechanism to ease the difficulty and duration of this training.